Gutter cleaning services is our business. For those who need cleaning or repairs in their gutter systems, Elkhart Gutter Pros can handle it for them. Our gutter installation cost are fair and quality driven for all the jobs we do. Our customers are repeating customers and naturally we welcome new customers in the Elkhart and surrounding areas here in Michiana. Why choose Elkhart Gutter Pros? We handle all types of gutters in the need of repairs and maintenance by cleaning or replacing them. Cleaning the gutters helps as well keeping the structure of home owners' house structure cleared from debris or harmful damage caused by gutters clogged up. This means cleared from debris, silt, leaves, and branches which can accumulate inside the gutters causing them to widen and bend. In fact, it's common to find bird nests among the debris since the tree branches which may have fallen on the rooftop have made it easier for birds to "move in" on the nests for breeding. Silt and leaves built up into the clogged gutters can also wreck havoc for the entire structure of the gutters and the corners of the house. This is what we can replace or clear out for homeowners in order to have a safer runoff when it rains.With the proper gutter installation instructions we have been tailored to meet, we have professionally been successful at it for many years. We have the gutter cleaning tools such as gutter guards and equipment. We charge by gutter installation cost per linear foot and since it is affordable and fast to install and clean by our crew, we have the best solutions for homeowners who need an inspection before they decide amongst our available options. The gutter prices vary depending on the repairs or installations that will be serviced. We can have an estimator go to your property to determine the price and cost of homeowners gutter repairs or maintenance service. We can give them a free estimate for the costs of the services that will be rendered on your property when it comes to gutter repairs and replacement or gutter cleaning and maintenance. Call us so Elkhart Gutter Pros can give you the best possible service for homes in need of gutter maintenance and services. Aluminum gutters are durable and do not rust or corrode regularly. They can be painted, but so can vinyl gutters. They are similar in scope and since they are both inexpensive, they are the used the most in residential homes, but in normal conditions. Vinyl Gutters are less expensive and light weight which makes it easy for those DIY projects. Although, they may be easy to install for home owners, they are the ones that can bend easier too. The cons for the vinyl is that they bend easy during the heaviest of rainfalls and snow. They are not recommended for those who live in the regions where there is harsh climates such as heavy rainy cities or harsh long snow seasons. They normally last less than 10 years. Although in better tempered areas, they can last longer. Heated gutters are great for those regions that need a "cover over the existing" gutter. It can deflect most debris and water which normally be lead to areas that are accustomed for clogs and backups. Although it isn't the only thing needed for these trouble spots. Moreover, they can resist the snow falls and heavy loads of snow that can pound the gutters during snow storms and harsh winters. Fascia gutters are the types that are heavily gauged-made and are also durable for heavy winds and hard downpours. With the increase of water flow on the gutters they can carry up to 33% more water than other conventional gutters. These extensions do reduce the possibility of overflow as well. Down Spout repairs are needed when rainwater exceeds the area of the gutters over time. you'll notice that the protection of the walls and even the foundation can take a toll from the excess water and because of this, it can wear the gutters, especially aluminum gutters. We specialize in down spout repairs in which the debris can't flow through because of clogged up gutters. This can cause major damage because of the soil erosion. Finally, most homeowners may simply need to replace their existing gutter systems.. 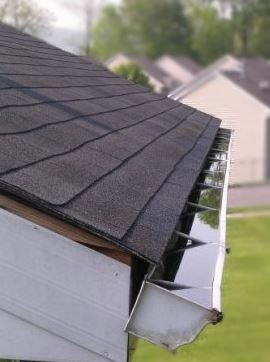 Here at Elkhart Gutter Pros, we specialize in the maintenance and repair of gutter installation and gutter repairs. Don't wait any longer, call us today, we can have your gutter systems cleaned and maintained before the winter season hits the Elkhart area. Prevent gutters from more damage and clean them today. Call Elkhart Gutter Pros. How are your gutters looking today?